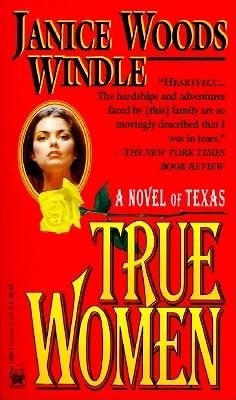 Alive and pulsating with the events of our history, TRUE WOMEN tells the story of two dynastic family lines in Texas, the Kings and the Woodses. Euphemia Texas Ashby King could ride and shoot like any man, and she was there when Sam Houston's rag-tag army routed Santa Anna at San Jacinto . . . . Though she risked her plantation running the Yankee cotton blockade during the Civil War, Georgia Virginia Lawshe Woods still had to defend her family from a corrupt Yankee officer . . . . Bettie Moss King survived wolves, storms, and the Ku Klux Klan to steer her family through the turbulent birth of modern times. Inspired by the author's own Texas roots, here is an unforgettable saga of the grit, determination, and courage of TRUE WOMEN.